Other countries' interpretations of American culture can teach us important lessons, like that team hustle is just as valuable as player talent, or that having both hustlers and players doesn't mean you can rap. It can also teach us about tubed meat, as at Hotdogeria. 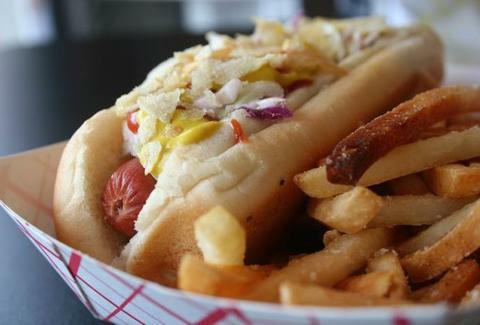 From a Mexico City native who encountered folks from all walks of life craving the idiosyncratic street dogs of their native lands, Hotdogeria's a fiery red stand that's taking on different styles of wieners from across the Americas, also the premise of a show pitched by network execs confused as to the meaning of "food p*rn". Signature dogs include the Mexico, wrapped in bacon and served w/ pico de gallo, mayo, ketchup, and mustard; the flat-grilled Cuba, with mojo sauce, avocado, and pineapple; and the Canada, which has mayo, chopped chives, cheddar cheese, and maple syrup, a combo that doesn't need Canadian Bacon to give you some Rhea. They also have South America well-covered, from the Brazil (mashed potatoes, bacon bits, mayo, tomato vinaigrette, shoestring potatoes), to the avocado & diced tomato Chile, to the Colombia, covered in, amongst other condiments, pineapple sauce, cole slaw, and potato chips, though if you can't stop, it'll end up being you who pops. Rounding it out're a few non-dog creations, including quesadilla-meets-grilled-ham-&-cheese concoctions (covered in the owner's mother's homemade ketchup) called Sincronizadas -- just try to become a rap star when you have to fire off eight words that rhyme with that.